Fairly early yesterday afternoon, my friend Pádraig posted on FB to say that after a sudden turn for the worse, Iain Banks had died early yesterday morning. I didn’t repost until I saw it confirmed elsewhere, because although there was really no chance Pádraig was wrong, I was still holding out a tiny thread of hope. Honestly, I have no business being so saddened by his death. I met him at a small convention in Belfast over the course of a weekend, and was completely charmed by him. I still, horrifyingly, haven’t read any of his books. But he was such an incredibly delightful man, so full of warmth and laughter, that it was impossible not to feel as though I knew him. That seems to be a common thread through those who met him briefly, from what I’ve been reading online in the wake of his death. Anyway, so another friend, Nicholas, reposted his 2007 Mecon report, and I thought that was a good idea, so I’m reposting mine (albeit edited down, because it was very long. And still is, but less so now.). Let’s see. Starting with Friday night, then, the pub quiz team I was on covered itself in glory by coming in dead last a second year in a row. We’re lulling them all into a false sense of security so we can come back and obliterate them, that’s what it is. While the quiz was going on, the con organizers came by and slipped pieces of paper into guest hands, so people would know what panels they were on. Paul, on my right, got one, and Leah, on my left, got one, but I did not get one. After a while, when the quiz was over, I said, “Um?”, and was told that since I hadn’t answered the email regarding which panels I’d like to be on, I hadn’t been put on any. That was sort of the point at which, “Um?” became the functional word for the actual convention part of the whole weekend. The email hadn’t gone out until Wednesday night or so, and it’s true, I hadn’t gotten to it, but I’d figured I’d just be put onto panels anyway. I’m a novelist, after all, and they knew that, so it seemed reasonable to expect I’d be put onto appropriate panels. Unfortunately, that’s not what happened. They said, “Just show up to whatever you want,” and I sort of went, “Um, okay,” though shortly thereafter Paul, outraged on my behalf, made them actually sit down and figure out panels for me, which mostly meant I volunteered for things and they wrote them down. Sadly, a list of panels with their panelists was never posted anywhere the attendees could see it, so nobody had any idea at all who was going to be on any panel, which can dramatically affect whether you want to *go* to one, so that was kind of a problem. Worse, by the end of the weekend it sort of felt like a lot of the con had been the Paul, Catie And John & Leah Show, as J&L had actually answered the email, and Paul had not only answered the email, but then thought better of his choices and answered it a second time, resulting in being on some totally inappropriate panels (which he removed himself from) but not on any appropriate ones (so he put himself on those ones, which kept him fairly busy). And, as ianmcdonald also hadn’t answered the email, he wasn’t on any panels either, and I’m not sure Alistair was on anything aside from the novel-writing panel, and the only thing Iain Banks (the guest of honor, for heaven’s sake) was scheduled for was his GoH speech on Saturday, we felt a bit as if people must be getting very tired of us. There was a point about fifty minutes in when the room next door had a burst of laughter, and Iain said, “Oh, no, they’re having more fun than we are, quick, everybody laugh really loudly,” and everyone *did*, and then burst into applause, and then laughed more. It was great. :) But the whole thing was going quite well, really, with questions from the audience and plenty of commentary on our different writing styles (as in the process, not as in the work itself) and we were going along great guns, and it got to be a few minutes past the hour, and they threw us out of the room. The poor guy whose panel we hijacked took it pretty well. The topic had been supposed to be about dead authors telling tales, and he was clearly surprised when dozens of people swept into the room. He said something like, “Wow, I didn’t think so many people wanted to talk about this!” And we, quite cheerfully, if perhaps not entirely kindly, said, “We don’t! We’re hijacking your panel! We’re going to do something else entirely!” He looked rather bewildered, but pleasantly so (an expression he never fully recovered from), and said, “Oh, okay,” while the pros all sat down around him or in the front row of the room. and Ian McDonald’s Muppets, and it was all really quite fantastic. We felt that it’d been quite the success, and it was a really good note to end the panel part of the convention on. 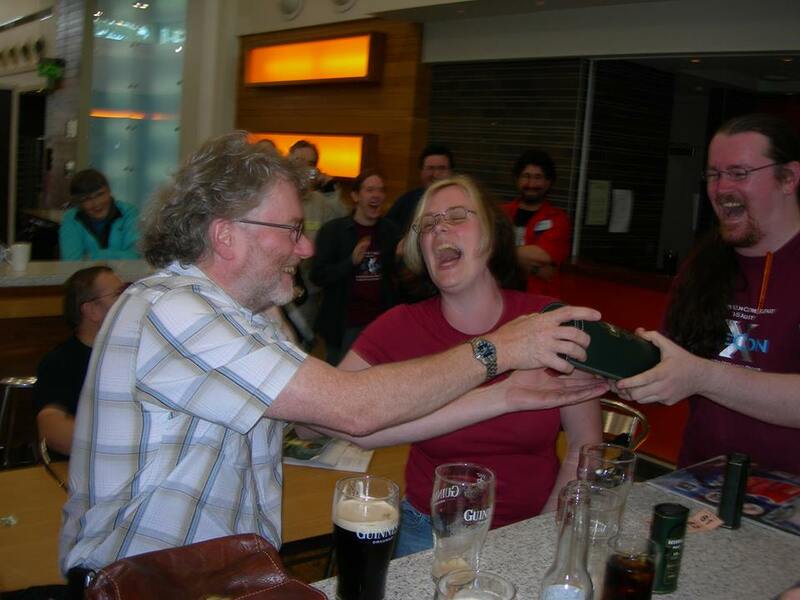 I didn't know him well either: I've served him a fair number of drinks over the years at cons, and exchanged the odd word, but he was a huge part of the texture of British sf for many many years and everything feels odd without him. A lovely man, a great writer. Great stories Catie. That photo seems to truly capture what everyone whoever met him says about him. What a great legacy to leave behind, great books and so many memories of laughter. Rest in peace indeed good sir.